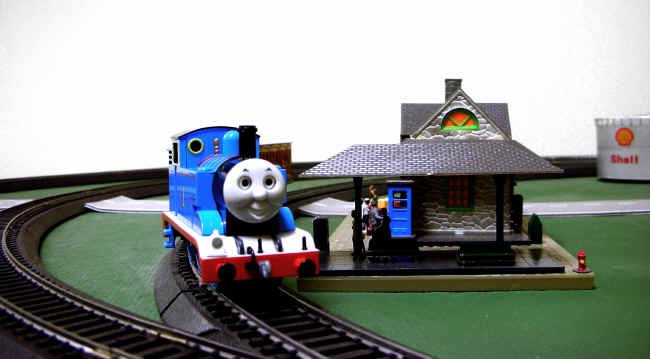 Above – About 1941 to 1943 – As a small child, I still remember a neighbor bringing a standard gauge model train to our house (like the one shown) and setting it up on the floor of our living room. Dad and I played with it for hours. 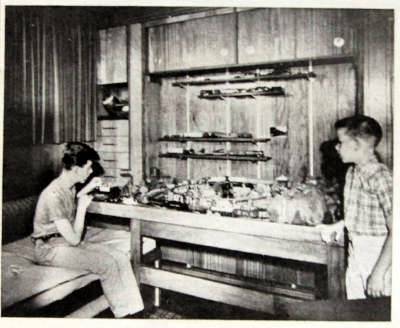 Above – About 1943 to 1965 – Eventually, Dad bought a Lionel O-27 train for my younger brother and me. It was probably a Christmas present about 1943. We played with it in Frankfort and then it moved with us to New Orleans when Dad joined the Navy. 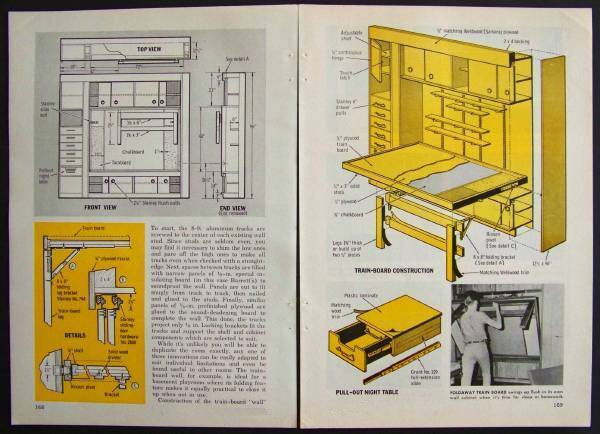 He built a layout that folded up into a bookcase, like the one shown below. 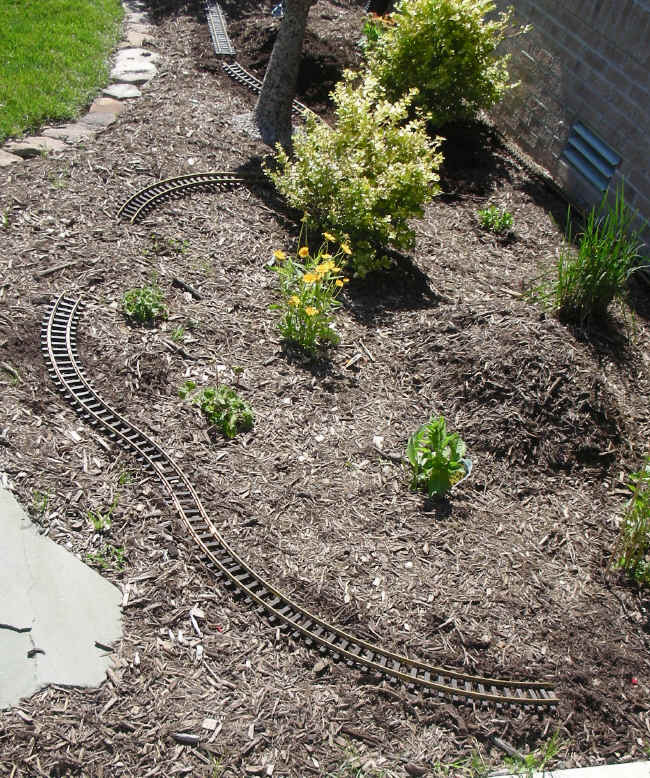 Remembering to park the trains on the shelf before folding it up was the trick. We lived in Decatur, Georgia for a couple of years and the foldup layout was set up there. Then we moved to Ashland, Kentucky and, over time, we built a very elaborate, two-level layout in the basement. We enjoyed it for many years but when we left home for college, Dad gave it all away! Since we lived in Kentucky coal country, we did have a C&O switcher like the one shown above. 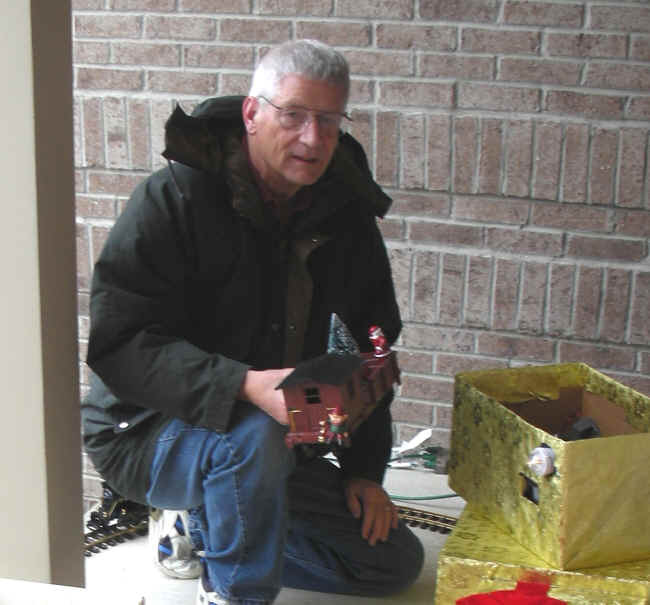 One of my best Christmas presents ever was a C&O passenger car that Dad built from a kit. When I came down on Christmas morning, it was sitting on a couple of pieces of track with the interior lights on. Seems like yesterday….. 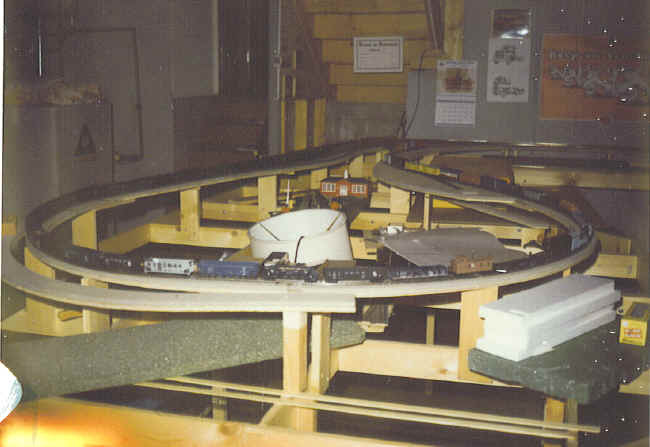 Above – About 1968 – Fort Wayne – My first model railroad as an adult. 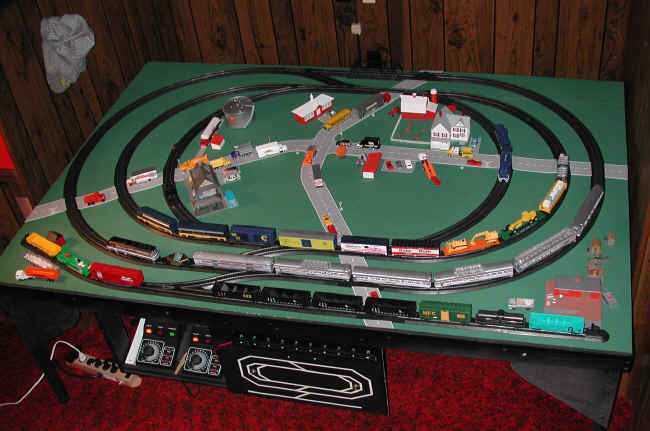 The N-scale layout. 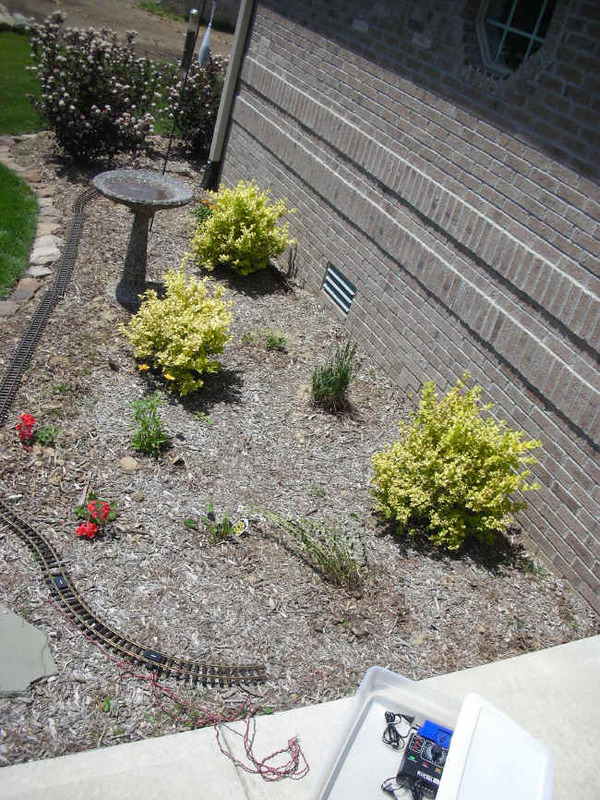 Above – About 1972 – The N-scale layout got moved with us to Illinois, got contours, got sold. 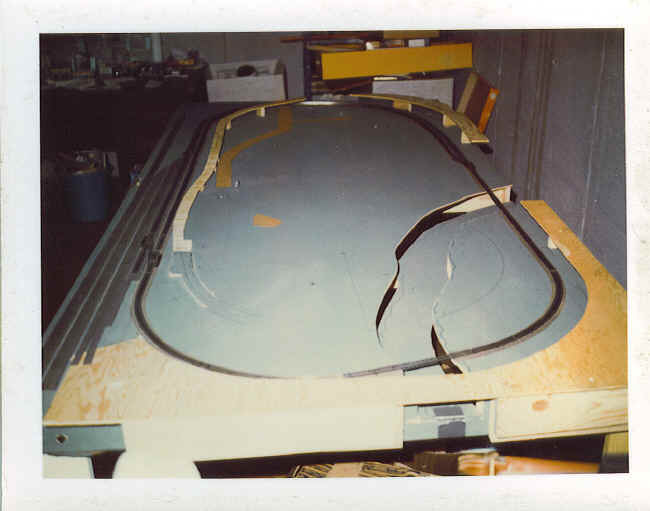 Above – About 1973 – Homewood, Illinois – An ambitious HO-scale layout was started. Above – About 1973 – Homewood, Illinois – Very ambitious. Above – About 1973 – Homewood, Illinois – Big yard under construction. Above – About 1973 – Homewood, Illinois – A brass C & O collection was started at the same time, with the notion of securing one of each of all the available engines in a rapidly growing list. The “want” list grew faster than the budget. 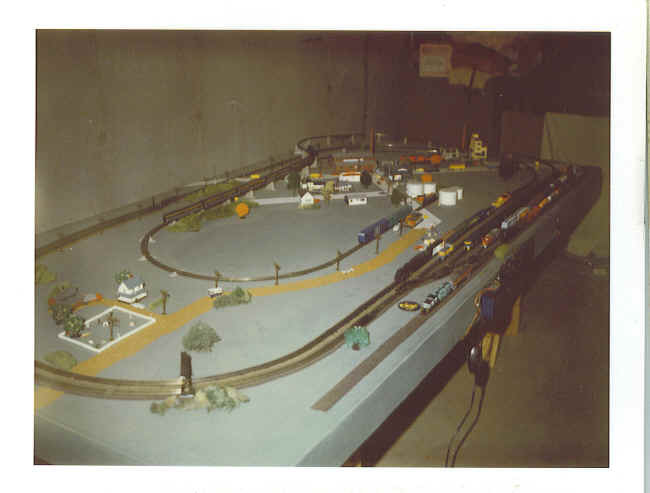 After we moved back to Fort Wayne in 1974, another ambitious HO layout was started. It was enjoyed but never completed so it was taken down in 1979 and most of the equipment and brass collection was sold. I am sure that I took lots of pictures, just can’t find them. 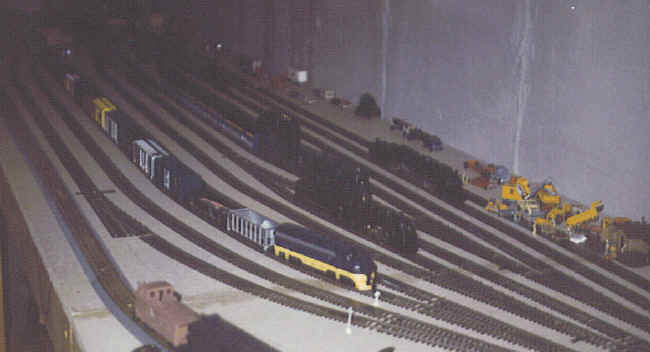 Above – Picture taken in 2001 – Fort Wayne – In about 1995, grandson one Kyle and I built an HO layout for him to enjoy at our house during the time when we babysat fulltime with him. We even drove a golden spike. 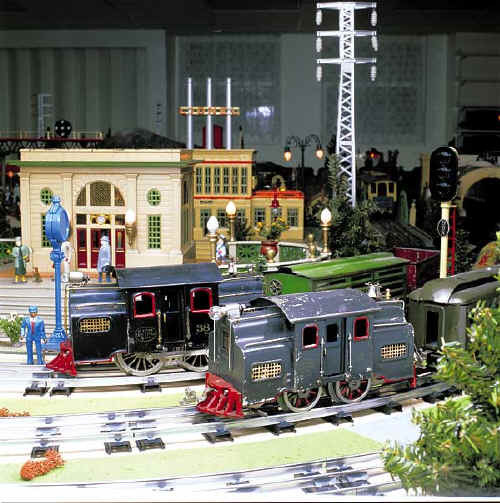 Above – 2001 – Fort Wayne – There is an actual “Kyle” Railroad in Kansas so there had to be a model, of course! 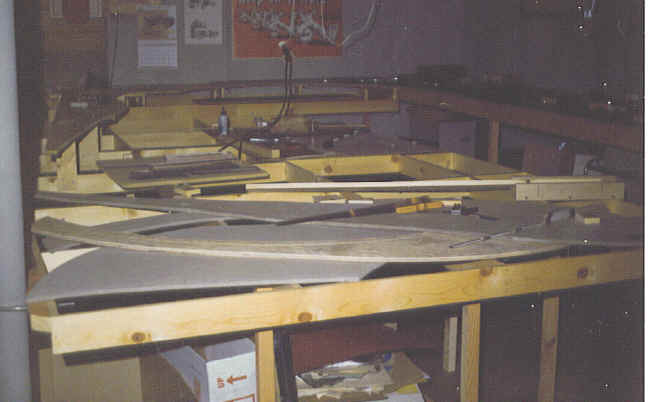 These were built by my late friend, Bill Eichhorn. 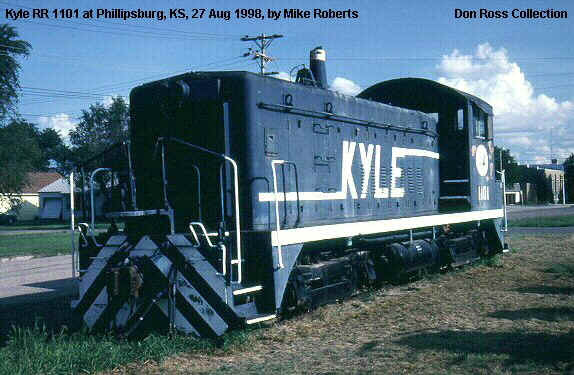 Above – 2007 – Noblesville – With the move to be near the younger grandchildren, another useful blue engine has been spotted on the Kyle Railroad. 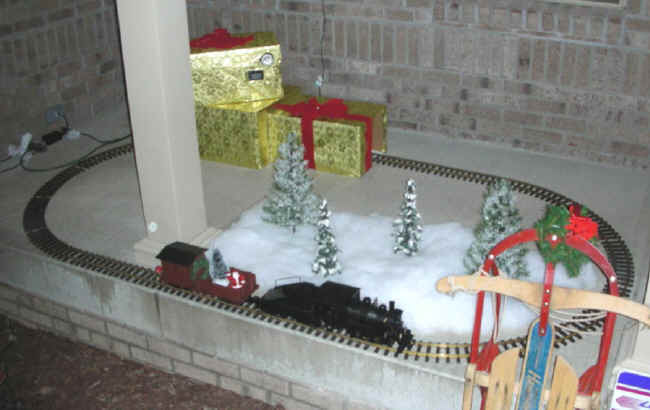 Above – Christmas 2007 – Going all the way back to something close to my standard gauge beginnings, I bought a Hartland 1:24 scale, G Gauge 0-4-0 and made an automated Christmas display for the front porch. The motion detector seen on the upper gold box started the train running when someone approached. Clever wiring made sure the train always stopped in the “tunnel”. Kids young and old did note, however, that it didn’t make any chugging noise. That was corrected in 2008, check the bottom of the Index page for the long and exciting Santa train story. 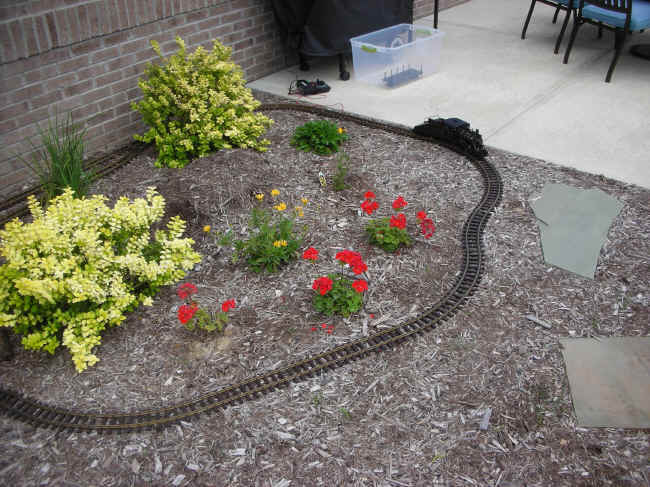 Above – June 1, 2008 – Trackage rights were obtained in the back yard garden so the trains could entertain the children of all ages year ’round. Above the right-of-way possibilities are considered. 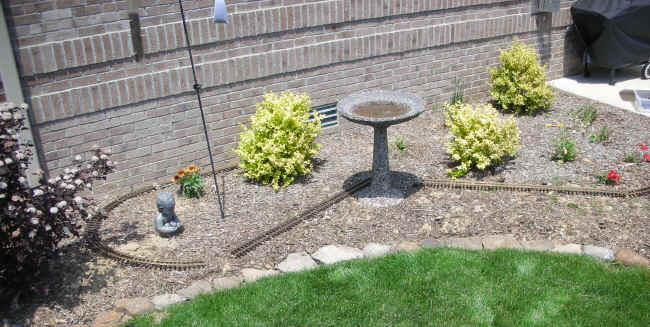 Above – June 17, 2008 – Maybe a loop behind the bird bath…. Above – June 17, 2008 – …. 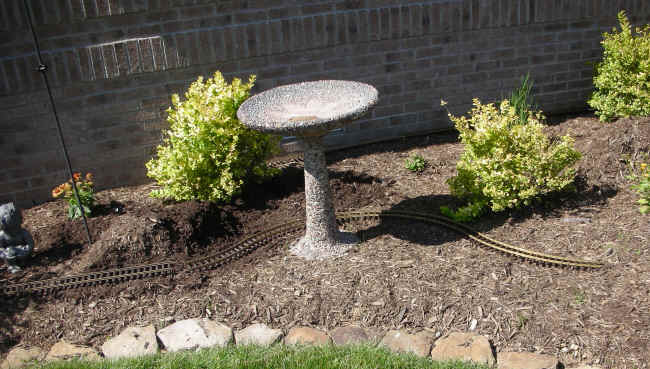 and a few more curves leading to the bird bath could be a possibility…. Above – June 17, 2008 – …now it’s looking better! Above – August 9, 2008 – The short line has been in business for more than a month, time for some pictures. Above – August 9, 2008 – Lots of curves on the front side mean careful running until we are sure the debris is clear. Above – August 9, 2008 – Some of the crew is anxious to extend the track south (toward the camera). Above – August 9, 2008 – After a hard day of delivering the goods, old Number 7, the only engine on the line at the time, heads for the engine house. Above – August 21, 2008 – Noblesville – Old Number 7 gets a sound system! A complete tour of the TMRRR and a test of the new Ram 53 sound system. No, I don't. I raided it for parts and gave the remains to a friend.